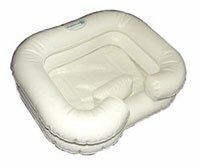 Hair Wash Basin Inflatable Ez Shampoo For Disabled is an inflatable basin designed for comfortable and convenient in-bed shampooing. The special design of basin hair wash provides secure, form-fitting support that cushions the head & shoulders and now includes a built-in inflatable headrest. The daily living aid personal care product is made of heavy-duty vinyl with custom drain stopper at the base of the flexible drain hose. The bathing accessory is 24" wide x 20" long x 8" deep. Hair wash basin is designed to be lightweight, portable and compact for convenient storage. Four-color retail box now features hang tab for pegboard display. Hair wash basin is so simple, fast and comfortable, it's head and shoulders above the rest. The unique hair wash basin EZ-Shampoo inflatable sink fills the need for an easy, refreshing shampoo for patients confined to bed. When hair wash basin inflated by mouth or air pump, the specially designed daily living aid EZ-Shampoo is a secure, form fitting basin that comfortably cushions the patient's neck and shoulders. A conventional drain hose efficiently removes soap suds and water from the hair wash basin. All that's required for cleanup is to towel dry the rinsed out sink, deflate, and fold up for prompt storage in a space as small as a folded towel. It's that easy! Hair wash basin is made of heavy-duty vinyl. Inside (usable dimensions) are 16 1/4" x 11 3/4". The bathing accessory cushions the patients neck & shoulders. Comes with 40" Drain hose and stopper.